At Fine Line Homes, we want to save you money on energy costs and help save the environment as best we can. 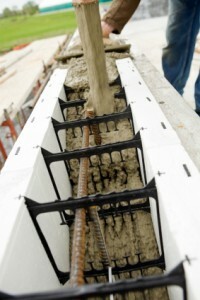 For eco-friendly home builders, this means sharing the benefits of insulated concrete forms (ICF). Insulated concrete forms were first developed in Europe during the aftermath of World War II as an inexpensive, durable way to rebuild their cities and towns. Basically, ICF is permanent building insulation that creates interlocking modular units. These cast-in-place, reinforced blocks lock together like Lego bricks. Dry stacked without mortar, these bricks then get filled with concrete for exceptionally strong wall, floor and roof structure systems. Then, reinforcing steel is usually added for flexural strength. ICF is becoming the more commonplace construction form. It achieves high performance for energy costs, structural strength and elemental resistance. Overall, ICF is also the most cost-effective method of insulation. It is quiet, strong, safe, and easy to construct. Need More Reasons to Love ICF? ICF keeps a building airtight, reduces heating costs and adds strength. Choosing ICF saves eco-friendly home builders money and time – it’s a win-win for everyone! How Does ICF Perform in Alberta’s Climate? ICF was practically designed for Alberta’s cold, windy climate. An ICF building’s wall systems are at least 40 per cent more energy efficient than conventional methods of insulation. And for builders it’s even easier to pour concrete into ICF during the winter months than during the summer! Typically, ICF costs a mere 5.4 per cent more than wood frame houses of the same design, but ICF will save you significantly in the long run. Additionally, the long-term energy efficiency of ICF will save you 30 per cent to 40 per cent on your energy bills.The long-term energy efficiency of ICF will save you 30 per cent to 40 per cent on your energy bills. One way to look at it is that typically the extra mortgage costs are mostly covered by the additional savings on your energy bills. Fine Line Homes are big fans of ICF. We should be. These stable insulators are proven to prevent heat loss, are non-toxic, mold resistant and resist nature’s biggest challenges. They prevent air penetration and are air and moisture tight with a high R-value. For eco-friendly home builders, ICF is simply the best choice. Talk with the Fine Line Homes helpful staff today for more information and discover if it’s right for you.